Went back to one of my old faithfuls: Freaks and Geeks ---hilarious and heartfelt. Who's your favorite character (s)? I love the "Geeks": Bill, Sam, Neal, Harris, and Mr. Rosso. MIRACULOUS: TALES OF LADYBUG & CAT NOIR, a CGI-animated kid superheroes series. I watched the 7 episodes on the DVD, and was absolutely charmed by this show. A Vol. 2 DVD is due at the end of August. The show began airing in December 2015 on Nick at noon on Sundays, and the complete first season will have 26 episodes, 12 of which still have not aired on Nick (they air earlier on TB1 in Paris, where the series began in October 2015). The CGI animation is movie-quality, looking something like a Dreamworks or Pixar animated film, as opposed to the sometimes lower-budget quality you usually get for television animation. There were something like 7 or 8 different companies involved in producing and/or funding this series, which is shown in 120 countries worldwide. The basic concept is similar to something like Barbie in Princess Power, but otherwise that comparison does Miraculous a disservice. The superheroes here are a fusion of American style with their Japanese counterparts, the highly-stylized magical girl/henshin hero genres (which basically use the same tropes but the magical girl genre is almost completely anime, while the henshin hero genre is almost completely tokusatsu). Like the latter, all the episodes have a rigid (but comforting) format, in which certain things will always occur, and in a specific order. A good deal of emphasis is placed on the ritual of the transforming sequence, with its codified poses and movements, each hero has an "akuma" (a magical creature/pet), a "miraculous" special transforming totem (earring/ring) which absorbs their akuma to transform them, a special weapon (yo-yo/baton), and a 'final move' superpower (lucky charm/catastrophe) - after using which, they'll use up their power and be shortly forced to transform back to their everyday selves. 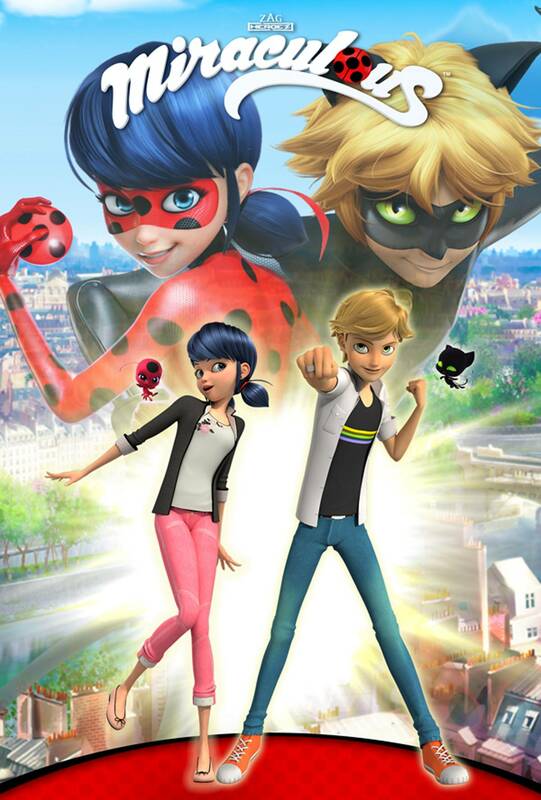 Quote Set in modern-day Paris, the series focuses on teenageMarinette Dupain-Cheng and her classmate and crush Adrien Agreste.When evil arises, Marinette transforms into her secret superhero persona Ladybug, while Adrien transforms into his superhero persona Cat Noir, using powerful objects known as the Miraculous. Oblivious to each other's true identities, the two work together to protect Paris from the mysterious villain Hawk Moth, who covets and attempts to steal their powers by using his akuma, butterflies infused with black energy, to influence and transform everyday citizens into supervillains. After watching the first Shout Factory DVD volume of MIRACULOUS episodes, I discovered that the last 10 episodes of the series are up on the Nick website for streaming viewing (http://www.nick.com/miraculous-series/episodes/), so I'll probably watch those later today or early tomorrow. The Suite Life On Deck is going be on The Disney Channel at 4 am..
Roswell - not a sci fi fan usually but thought I'd give this a try. I always thought Roswell was the original Smallville. Different type of aliens, otherwise the same basic premise. More Season 1 episodes of Miraculous Ladybug on YouTube. Yesterday I watched Dawn of the Planet of the Apes on DVD. What a great film. The first one was really good, but the sequel is excellent, even better. THAT, in my opinion, is how to do a reboot. They really took only the most basic concept from the original film franchise (ignoring the original novel by Pierre Boule entirely, as well as the atrocious Tim Burton reboot misfire) to come up with a completely original new spin, with an all-new story and characters (there's one character who's only vaguely based on one from the previous movie franchise). An intelligent, well-scripted and acted film, and fairly scary to boot. Definitely much more believable in this new incarnation. I just watched The Suite Life On Deck.